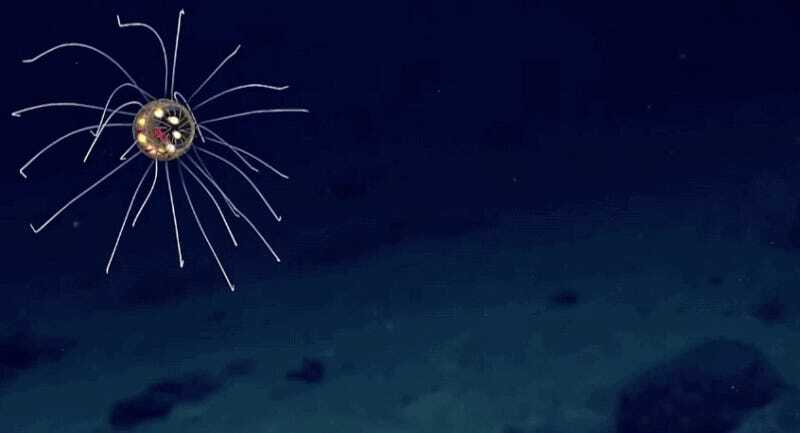 Earlier this week, researchers working on the NOAA’s ship Okeanos Explorer dispatched their remotely operated vehicle Deep Discoverer to the Enigma Seamount, a ridge located just west of the Mariana Trench. At a depth of 2.3 miles (3.7 km), it managed to capture video of this rather remarkable jellyfish. Marine biologists have identified it as a hydromedusa, belonging to the genus Crossota. These jellies are usually quite small, either transparent or lightly pigmented, and featuring deeply colored internal features in the “bell,” or head. These sea critters typically live for a few days, and never grow more than a few millimeters in size, though some have been known to grow a few centimeters across and live for months. This particular specimen features two sets of tentacles, one short and one long. Towards the start of the video you can see that its long tentacles are even and extended outward, while the bell is motionless. This likely means the jellyfish is in ambush predation mode. Within the bell, the radial canals in red are connecting points for what looks like the gonads in bright yellow. The Okeanos Explorer is currently making the rounds near the Marianas Trench, and the marine biologists on board are finding all sorts of amazing things, from fields of small sedimented balls through to slimy deep-sea acorn worms. You can track the ship’s progress here, and even watch a live-feed of the exploration here.